Your teeth and the way they fit together (occlusion) can have a huge impact on TMD. Malocclusion, or a bad bite, can be a large contributing factor to TMD. In many cases, we will fabricate an occlusal splint to relieve TMD symptoms. This is a professionally made and adjusted mouth guard. 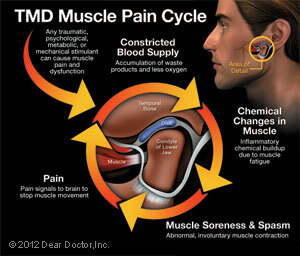 If you are having TMD symptoms, please do not go to purchase a generic mouth guard at the store. This will make TMD symptoms worse because these kind of mouth guards cannot be adjusted and will cause you to clench more. Habits such as clenching and grinding can cause you to to experience more pain. Please remember that the only time your teeth should touch is when you eat. All other times, your lips may be together, but your teeth should not touch. 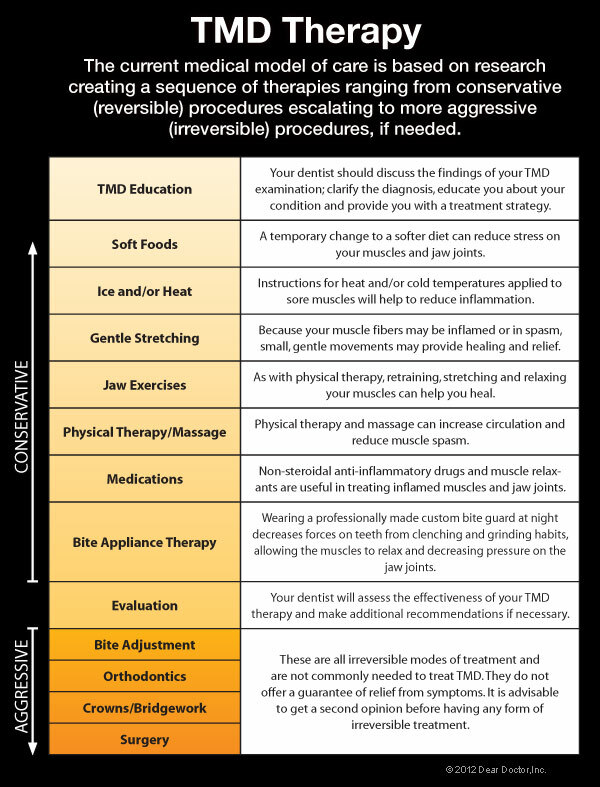 Sleep habits have a significant impact on TMD. Sleeping on your abdomen will cause you to clench more. The muscles of your head and neck like to be in a neutral position. You do not want to put your face in the middle of the pillow when sleeping as this puts pressure on the facial muscles and jaw and can negatively impact the jaw joint. If you sleep on your side, end the pillow even with your ear so that none of the pillow goes past your ear and pushes on your jaw. Don't place a hand or arm under your pillow or on your face, as this will cause pressure on the joint and cause you to clench, grind, or have pain. Prolonged computer work can also impact TMD. If you are constantly tipping your head up to look at a monitor, you may unconsciously position your jaw forward. We can show you stretches to do that will relieve tension in the muscles of the head and neck as they relate to computer work. Clicking Sounds — Some people with TMD hear a clicking, popping or grating sound coming from the TMJ when opening or closing the mouth. This is usually caused by a shifting of the disk inside the joint. Someone standing next to you might even be able to hear it. Clicking by itself is actually not a significant symptom because studies show that one third of all people have jaw joints that click. 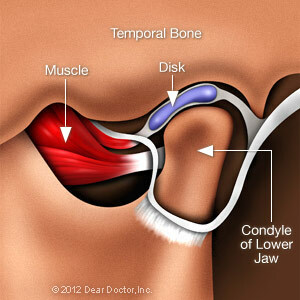 However, if the clicking is accompanied by pain or limited jaw function — the jaw getting “stuck” in an open or closed position, for example — this would indicate TMD. 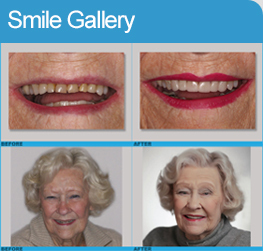 Looking to get TMD and TMJ treatment from Gentle Art of Dentistry? Call us at (217) 422-7448 for more information!